Build Quality (8.5/10): Having recently reviewed a number of DJ headphones from big name manufacturers such as Audio-Technica, Denon, and Ultrasone, I was surprised by just how well-built the $80 DJ100 is. Much of the hardware is metal, including the inner headband, rotating hinges, and the outside of the earcups. There is still plastic used on the forks and inside the cups but on the whole the build is quite impressive. The thick coiled cable is on the heavy side but terminates in an iPhone-friendly 3.5mm plug, implying that Koss intended for the DJ100 to be used portably. And of course Koss is willing to back the solidity of their headphones with the usual lifetime warranty and replace the headphones for the cost of shipping should anything go wrong. Comfort (8/10): The DJ100 is circumaural in size but the cups aren’t very deep on the whole. 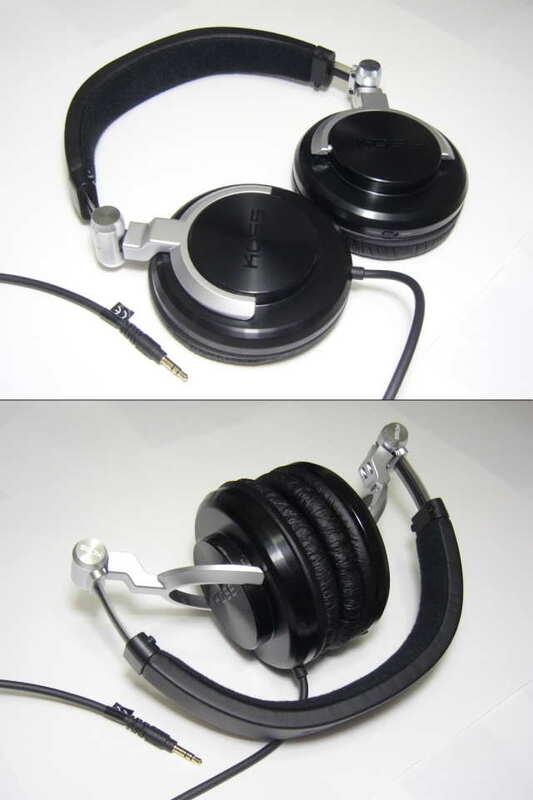 Clamping force is fairly low and the headphones still remain comfortable for quite a while when worn. A side effect of the low clamping force and loose fit is that the DJ100 is slightly less stable when worn on-the-go than some of the other sets in its class. Isolation (7/10): The slightly shallow fit limits isolation somewhat but sound leakage is extremely minimal. Sound (7.75/10): Despite having impedance and sensitivity identical to the ATH-M50 and Denon DN-HP700, the Koss Pro DJ100 exhibits higher dependence on amplification than both – and it’s not just the need for power. Synergy plays a huge role with the headphones and many amps simply don’t mesh well with them. A neutral or slightly mid-centric amp is preferred – I had good results with the Tianyun Zero, iBasso D10 (stock caps), and a mini3. Skipping the amp altogether is a poor idea – the DJ100 only reaches a fraction of its full potential unamped – the ATH-M50, Numark PHX Pro, and even the Denon DN-HP700 sound noticeably better straight out of my portable players. With a proper amp the low end tightens and increases in quantity, the soundstage opens up, and the upper midrange and treble become smoother and less fatiguing. Naturally, the DJ100 does not become a completely different headphone with the addition of an amp but it’s enough of an improvement to make me unwilling to use them without one. Koss advertises the DJ100 as having ‘Extreme Bass’, which couldn’t be farther from the truth to my ears. The bass is well-balanced and quite linear, with immediate impact and good speed. My well-burned-in set of DJ100s trails the Denon DN-HP700 very slightly in bass quantity and makes the ATH-M50s sound like absolute bass monsters. My usual reference set, the Sennheiser HD25, offers bass that is more tactile, forward, and impactful but also slightly more forward and intrusive than that of the DJ100. The midrange of the DJ100s is completely free of bass bleed but never sounds thin or lacking. In fact, the upper midrange is slightly forward (and becomes more so with the addition of a powerful amp) and most of the headphone’s energy is carried through the mids. Interestingly, the midrange of the DJ100 seems to carry slightly thinner notes than the bass and treble – an odd characteristic for a single transducer but one that makes the headphones sound leaner and crisper. Vocals, especially female vocals, come across very strongly and carry plenty of texture. Those who find themselves easily fatigued by strong upper midrange presence will probably want to give the DJ100s a pass but lovers of forward, slightly resonant vocals will undoubtedly be pleased with the overall balance. Moving on up into the treble, the DJ100 doesn’t sound perfectly smooth to me, but then headphones with strong treble presence almost never do. It does get slightly smoother with an amp but many of the more laid-back sets still have the upper hand by a mile when it comes to smoothness. Treble clarity is excellent and detail is on-par with the other similarly-priced DJ sets. There is a tiny bit of perceptible treble roll-off at the very top – hardly an issue under normal listening conditions but noticeable in a head-to-head comparison with the HD25-1. On the whole the DJ100 is still slightly brighter and colder than neutral but not distractingly so. The dynamic range is lacking slightly as well – the DJ100 is a bit ‘shouty’ in nature, not unlike a lower-end Grado headphones or the HD25; subtlety is not really its strong suit although it fares more than well enough for an $80 headphone. The presentation, on the other hand, is really quite good for a closed headphone. The soundstage has good depth and width and only gets bigger with amplification. The HD25 sounds positively claustrophobic in comparison. Separation and imaging are good as well but the DJ100 wouldn’t be my first choice for big-band or orchestral pieces. It does work surprisingly well for gaming, however. In addition, the DJ100 is extremely revealing of poor source material – pairing them with an unamped portable player and 128k mp3s is a recipe for major disappointment. Value (8.5/10): The Koss Pro DJ100 is a solid mid-range headphone that scores plenty of points for build and sound quality but loses out heavily on portability, partly due to the somewhat heavy construction and low clamping force and partly due to the amplification requirement. There is still much to like about the DJ100 – for a headphone that can easily be found in US retail stores it is priced very reasonably and the lifetime warranty should be a welcome reprieve for those who like to be rough on their gear. As usual, the sound signature won’t be for everyone – the DJ100 boasts tight and controlled bass, mids with a slight peak towards the top, and prominent treble. I think they excel with acoustic and vocal-centric tracks and break down with hard rock and metal, for which they really don’t have the correct tonal balance, and big-band/orchestral pieces, which benefit from a less aggressive presentation. With that in mind, the Koss Pro DJ100 extends the bang/buck of the other Koss headphones featured in this review to a whole different price range – a great proposition for budget-conscious buyers. Do you think an xduoo x2 (250mw @32 ohms) would have enough oomph to drive the Pro DJ 100s to their full potential? Thanks for your input. Output figure looks fine but I haven’t tried it myself so I can’t say definitively. I’ve been a big fan of the Koss sound since my first pair of Porta-Pros (1984 I think), I might have to get these just to find out! Basically I would want less presence in the upper midrange than these have. In a similar sort of price range the Panasonic RP-HTF600 would be my preference over these. I would also accept a Sennheiser HD429 or Creative Aurvana Live!.